Week two is here! The Monday Night Football game of the Week features the Denver Broncos at the Atlanta Falcons. These two teams are both coming into the game fresh off wins in week one. Denver stayed at home and knocked off the Pittsburgh Steelers on Sunday night. This was the first game for neq quarterback Peyton Manning as a member of the Broncos. For Atlanta, they were able to pick up a road victory. The Falcons smoked the Kansas City Chiefs and moved to 1-0; tied with the Buccaneers at the top of the NFC South. MNF betting can be quite profitable. Ready to bet? This bookmaker has the best odds around! Atlanta received a huge game out of receiver Julio Jones. Jones and Matt Ryan hooked up for 108 yards and 2 touchdowns in the game. Top receiver Roddy White also caught 6 passes, but just 87 yards, and did not get into the end zone. The running game for Atlanta was keyed by Michael Turner. Turner rushed the football 11 times in the game. Atlanta’s defense held the Chiefs to just 152 yards rushing, which was the fifth best in the first week of the season within the NFL. The Falcons and Saints are the two favorites out of the NFC South. For Denver, they are in love with their new quarterback. After taking a season off due to injury, Peyton Manning returned to the field and didn’t seem like he skipped a beat. Manning passed the ball all over the field in a Broncos win. The quarterback finished with 253 yards on 19 of 26 passes; and two touchdowns. Manning’s top target was Demaryius Thomas, who caught 5 passes for 110 yards and a touchdown. Denver’s defense held the Steelers to just 75 rushing yards in the win. The Broncos and Chargers are the divisional leaders after one week in the AFC West. Let’s get straight to it. Bet on this MNF game at our favorite bookmaker. The Falcons are a three point favorite in this game. This game is a very tough game to choice, because both teams are very solid. Atlanta had a weaker test in week one, but they took care of business on the road. How will Manning be able to respond to his first home game as a Broncos quarterback? 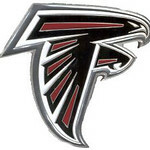 We are going to take the Atlanta Falcons to win this game straight up. We are also going to take Atlanta -3 as our bet. We feel the Falcons are too experienced to let the hype of Manning coming to town bother them. Matt Ryan continues his early success with a win. The total is 51. The Broncos can play some defense. We look for this to be a relatively low scoring game. In the end, the Falcons get 24 up on the board, while Denver finishes with just 20. We are going to take the under 51 in this game, and take it to the bank. Be sure to check out all of our NFL picks and predictions, and have fun following the games. This one, along with many of the others will be great games!